Our founder, Mike Green, had a passion for fire prevention. He got into the business by recharging old or used up fire extinguishers from his very own garage. Mike noticed there was a need for a business, that people could trust, to help that prevent fires in their home or business. He opened his business with his two son-in-law’s, out of a single storefront, and soon business was booming. Mike than assembled a team of experienced, highly trained loss prevention specialists, all of whom are ready to assist with your fire, safety, and security needs. At Mike Green Fire Protection we have a committed and dedicated approach to industry and product knowledge. Our staff takes pride in having the latest training available, keeping up to date on their fire safety education, and having the latest certifications. In the event of a fire in your home or business, a portable fire extinguisher will act as your very first line of defense. It is essential that the extinguisher be full charged, should a disaster strike. It is very common for the users of fire extinguishers to have little or no experience operating one, so it would be wise to ensure that everyone knows how to use and where to find the fire extinguisher. Charging the weight of the unit. Inspecting the valve & shell for corrosion or damage. Checking the hose treading & possibly replace hose (if need be). Checking the locking in and resealing after inspection. Ensuring the unit is mounted with proper hanger, in the appropriate location. Checking that the unit’s instructions are clear and accessible. Have Mike Green Fire Protection service your extinguishers annually to keep your home or business in accordance with insurance regulations, the Fire Department, OSHA (Occupational Safety and Health Administration). Having a functioning fire alarm system is critical to detecting a fire early, which could help save lives in the event of a devastating fire. 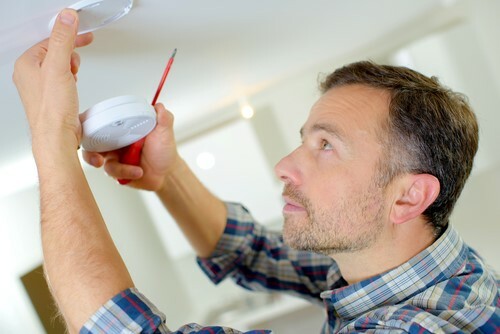 Mike Green Fire Protection will install, maintain, repair and inspect a plethora of fire alarm systems. Checking the condition of the alarm panel and related equipment. Testing of the smoke & heat detectors. Testing notification equipment, including audible, and strobe lights. Checking the status of any batteries. Inspection of tamper switches, low-air alarms and flow switches. Founded in 1945, Mike Green Fire Protection has been a recognized leader in loss prevention and fire safety for 71 years! Since it has been family owned and operated since its creation, Mike Green Fire Protection has always made it a priority to ensure the finest customer service. Protecting everything from high rise buildings, to corner retail stops, and everything in between. To get your home or business protected today email info@mgfire.com or call (818) 989-3322.